This blog is a journal for my endeavors in guitar building. As this is my first build and I intend to use as little prefabricated materials as I can in order to learn as much as possible about the process. I'm sure I will at times regret this decision however, I hope it will be worth the effort and pay off in the end. Apart from tuning machines, fret wire and a few sheet of veneer for purfling and rosette this represents everything I'll be using to make my instrument from. From left to right: Englellmann spruce (Picea engelmannii) for the top and bracing. Bolivian rosewood (Machaerium scleroxylon) for the fingerboard, bridge and headplate. Honduran mahogany (Swietenia macrophylla) for the neck, kerfing, back bracing and endblock. 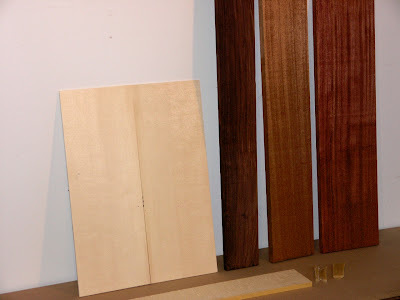 The last piece is Bubinga (Guibourtia tessmannii) that will be resawn into back, sides and binding. I bought the spruce on ebay form Kootenay Tonewoods. It was sold as a lot of five tops graded AAA for about $120 including shipping and free bracewood. 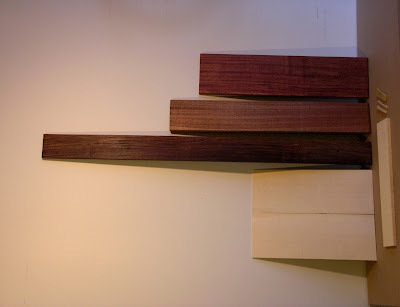 The Bubinga, the Mahogany and the Rosewood all came as 4/4 stock from a local lumber yard. It was bought little by little over the past year or so and came to about $60 altogether. Both the bubinga and the mahogany have some crossgrain fractures, that I think I'll be able to avoid when they are sawn up for their purpose. The bone in the lower right hand corner is cattle bone, also from ebay. I got them form Tropiworld who sold them in boxes of fifteen for $20 including shipping. All in all the guitar should come in well under $150 in raw material and hardware. On top of that comes glue and finish materials and a few other bits and pieces. that's the Erik I know, if your are gonna do something, you will damn well do it right! Carving the Heel - Part 1. Carving the Heel - Part 2. Carving the Heel - Part 3. Preparing Rosette Elements - Central Motif Elements, Part 1. Preparing Rosette Elements - Central Motif Elements, Part 2. Preparing Rosette Elements - Central Motif Elements, Part 3. Soundboard Thicknessing and Deflection Testing, Part 2. Preparing the Back, Part 1. Preparing the Back, Part 2.